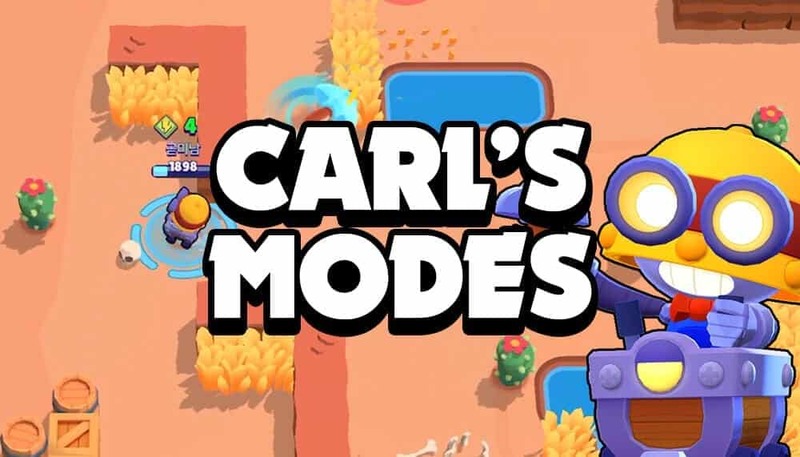 Best Game Modes for Carl (15+ Tips Included) | Brawl Stars UP! Hello guys, we’ve got Carl’s game mode tier list here. In this article, we’re going through each of the game modes, starting with his worst game mode and ending with his best game mode to play in. So that despite his weaknesses, you guys can know where to push him! What Are The Best Game Modes for Carl? For this game mode, Carl will be placed in the F tier (Sorry Carl). There are two things that making great result in Bounty. The first is survivability, which Carl has that because he’s got a ton of HP and also able to attack from a distance. But the second thing, which is more important, is the ability to finish off an enemy to burst them down. And the thing with Carl is he can’t do that. The map with lots of walls is kind of the best map to play him in Bounty. But unfortunately, he just struggles so much. It is so easy to keep your distance from him especially for Piper or Brock. They’re just gonna be so far away from Carl, so it’s too easy for them to dodge his shots. If he got his super, he can be a really good counter against Piper. She can jump away but it’s kind of gonna kind of dependent. If Carl’s right next to Piper and she uses her super, Carl can still use his super to get to wherever she’s landing. However, it’s still not recommended to play Carl in Bounty. Once again, Carl got into the F tier list. There was a lot of debate on whether or not he could be decent enough for B tier. There is something to be said about the fact that he can attack multiple targets. For example like Rico, he can shoot the safe from a distance like Carl can but put damage on one target, and Carl can damage the safe and any Brawlers that are right there. But the thing is Rico has more DPS at that range without any walls that just makes it really difficult for him to actually do very well. There’s simply just better options out there to play in Heist. The third worst game mode is Siege, where we decided to put him in B tier. There are a few different things to make Carl a decent option in Siege. He’s not the best but playable. He can deal damage to multiple Brawlers, and that does allow him to defend against the enemy boss, or also go on the offence against the enemy IKE while doing damage to enemy players. It is kind of situational on the map and players have to be kind of in the perfect position for that to work out but it can’t work sometimes. He also has massive area denial with his attack, allowing him to help keep any Brawlers pushed back. He’s a really solid counter against Jessie and Penny, who are really prevalent in Siege. His super allows him to quickly go and pick up bolts in a pinch, where it’s like coming down to the wire he can just run in there grab the bolt and then run away. But he just does not have the DPS to deal with the bots or the IKE turret and heavily relies on the enemy team to actually really be solid, so that’s why we decided to place him in the B tier. Carl is actually not a support Brawler like I thought he was going to be. He is a Gem Carrier. If you’re gonna play Carl in Gem Grab, gem carrier is the role for you. I really thought he was gonna be support or aggro, but he just does not have the consistent DPS. He doesn’t have really like the burst attention to keep people pushed back. He has really massive area denial which does allow him to be a Gem Carrier because even if you’re far away from the gem mine you can’t attack there and players have to wait. He also has really good survivability and that’s really important as a Gem Carrier. His super is excellent for defending. Killing an enemy gem carrier, running away, grabbing extra gems, you can run in and grab them and like run out. The super is really great for that type of situation and offers some area control as well. There are a lot of good things going for him in Solo Showdown. He has high HP and his ability to attack from a distance gives him a ton of survivability against a lot of Brawlers. There are few Brawlers can quickly take out Karl without any problems at all. Even Bull, who can take care of him up close, has to get close to him and deal with at least some damage. In Showdown, it’s really common for boxes to spawn right next to walls or somewhat close to walls, so that makes it really easy for Carl blast through those boxes and get those power points. That means he’s going to be powered up very early on, which gives him a solid advantage against a lot of enemy players. His super is so good at killing Brawlers and you can almost call any Brawler in the game with it in the right situation. The only Brawlers that you should never use the super on are Bull and Shelly. Even when you are against a Darryl or an El Primo, you could just circle around them. Because their attacks are split into different ways, he can get rid of a ton of their ability to deal damage up close, when he has his super to circle around them like. It’s such a good way for you to kill El Primo so easily. By doing that, his super can also be used to escape tricky situations or to chase enemy players. The hardest part for Carl in Showdown is charging up his super. I’ve mentioned a lot of reasons why he’s good in Solo Showdown. They’re all true but Carl is not very much of a winner in Solo Showdown. He’s not a finisher. He is really good at surviving for a long time but it’s so easy for Brawlers to dodge his shots. You can absolutely push him in Solo Showdown, but he’s not the best option, especially if you’re trying to go for that solid victory each time. In this Duo Showdown mode, he got into the A tier list. The reason why is because he’s gonna have a teammate, that is going to overcome his weaknesses, which is low damage. His high survivability is actually really good in duo Showdown because if your teammate dies even when you’re in a tricky situation, you can get out of it because of your HP or because you’re super. He works very well when pairing up with like Tara, Gene or Spike. Also the fact that Carl can pick up those boxes super quickly is obviously going to benefit your teammate. Another reason why he’s decent in duo Showdown is that he can build damage to more than one Brawler at a time and in solo or duo Showdown, Brawlers tend to clump up together. That means that there are going to be situations where you can be able to deal damage to more than one Brawler at a time and that’s pretty good. It’s not gonna happen very often because you’re so easy to dodge his attack but you guys get the idea. Carl still got into the A tier list for Brawl Ball game mode. Which means, he doesn’t get any S tier game modes because he’s just not that great. There are three major reasons why he is starting in the A tier for a Brawl Ball. He doesn’t lose ammo when he kicks the ball. And that actually plays a big role in the kinds of Brawlers that you’re gonna want to pick up the ball. A lot of times, it’s beneficial for you to duke it out against the enemy players rather than picking up the ball and kicking it to a more ideal location, just because you’re gonna need that ammo. Carl can do that, he can pick up the ball risk-free no matter when no matter where. He can pick up the ball and go kick it really fast to an enemy player and what that does is, they will kick it back to him because they’re Auto waiting or trying to shoot. They gotta get rid of the ball because you’re right next to him and he can just kick it back and forth and wasting their ammo. He is then able to just wail on them without them being able to do any damage to him and that’s a huge benefit for Carl that no other Brawler actually has. His super can help him travel very quickly. He can throw the ball up and then his super deal damage, keep people from pushing and then pick up the ball and then score. No one can pick up the ball in that type of situation without taking damage from Carl unless they take him out first. His high HP allows him to oftentimes just walk the ball in when he’s facing off against Brawler’s that don’t have high burst potential. All of these three reasons make Carl a great option as a ball carrier. These are why we could justify putting him in the A tier.